The archaeological record shows that primitive dental implants may have been used in the prehistoric age, and implants were in surprisingly widespread use by 600 AD. Modern dental implants were invented in the 1970s and have been used extensively since the 1990s. Yet despite this long history, and despite the fact that dental implants are now considered the gold standard for replacing missing teeth, dental implants are rivaled only by root canals in the sheer amount of misinformation that is still being spread. Here is the reality behind 4 myths about dental implants. It is true that the initial cost of dental implants is slightly higher than that of dental bridges, and a good bit higher than dentures. However, dental bridges require the sacrifice of healthy tooth structure, while dentures promote bone loss and are difficult to wear. When amortized over your lifetime, dental implants cost far less than either bridges or dentures. Bridges tend to fail in a decade or so, and they put the healthy teeth that anchor them at increased risk for fracture or decay. Dentures must be relined approximately every year to accommodate ongoing bone loss, and they are likely to break within 10 to 15 years. Partial dentures can compromise the neighboring teeth, while full dentures can actually put your overall health at risk over time by making it difficult to eat a varied diet. While cost is always a consideration, do not shop for dental implants solely on price. 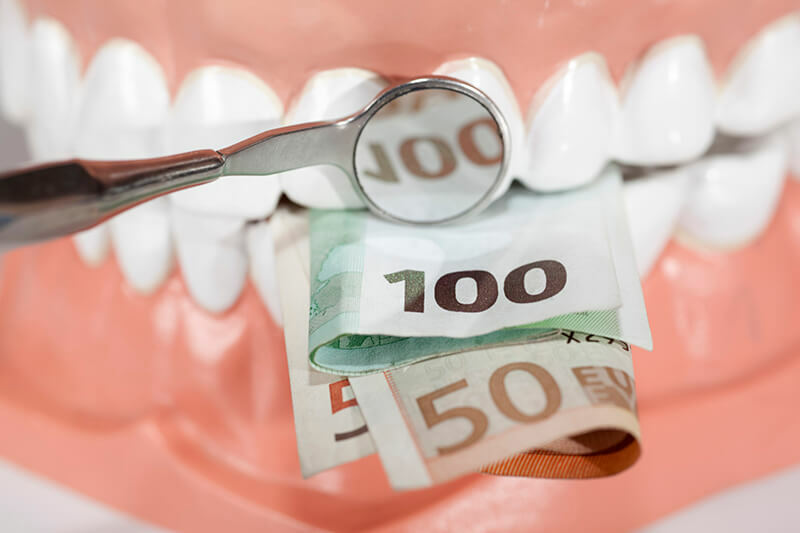 You do not need to see the most expensive dental surgeon in town, but “too good to be true” deals are not a smart risk to take with your oral health. While some discomfort can be expected from any dental surgery, implant placement is generally less uncomfortable than tooth extraction. A caring, experienced dentist with modern procedures can vastly minimize any discomfort. Sedation dentistry can further take the edge off, and you may even sleep through the procedure. If you are prescribed painkillers following your implant surgery, be sure to take them as directed. Staying ahead of any pain is the best way to ensure easy, quick recovery. Most people are fully back to work in just two or three days. Dental implants are made of biocompatible titanium, making it nearly impossible for the human body to reject them. There is a slim chance that the implants will not fuse with the jawbone as expected, but this is quite rare. Success rates across the board are approximately 95 percent, and a skilled implant dentist with patients who precisely follow aftercare instructions can easily reach a success rate of 98 percent. It is true that your oral health must be good before your dental implants are placed, so your dental professional provider will treat any underlying tooth decay or gum disease before scheduling your implant surgery. Likewise, if you have a chronic health condition such as diabetes, high blood pressure, or a bleeding disorder, it must be well-controlled to minimize risks from oral surgery. Finally, if you have severe jawbone loss, you may need bone grafting to ensure that you have enough healthy jawbone to support the implants. With these caveats, though, virtually anyone can benefit from dental implant surgery. Your dentist will make a thorough health assessment and, if necessary, work with your doctor to develop a plan of action to get you ready for safe dental implant surgery.